There are seven times more caribou and twice as many moose as humans (the two-legged population is only 35,000 in 483,000 square kilometres of terrain). And it’s a hearty three-plus-day drive from the “civilized” south just to get there, unless you prefer flying to Whitehorse and then renting a vehicle. Still, the Yukon Territory, in Canada’s far northwest, exercises a strong pull on the imagination of many road trippers, whether they’re driving up the Alaska Highway, backpacking or climbing in Kluane National Park or reliving the Dawson gold rush. The good news is you can drive through beautiful country, and maybe spot a roadside grizzly bear, without encountering another vehicle for perhaps half an hour at a stretch. 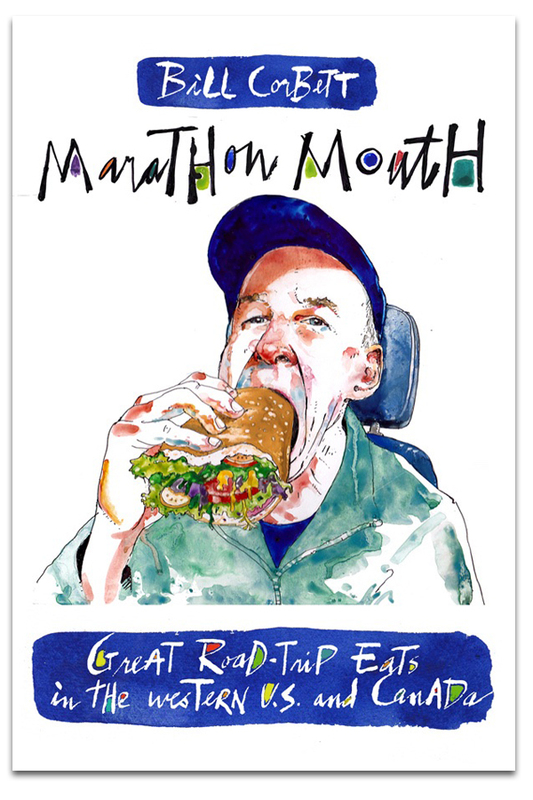 From a road-food perspective, there’s a surprising number of good dining and bakery/coffee shop options, though outside Whitehorse many places shut down after Labour Day. Considering the distance most groceries must be shipped from the south, prices aren’t unreasonable. And in this northern frontier, almost no eatery expects you to change out of your muddy pants and boots. Throughout the territory, you can wash that dust off with excellent Whitehorse-produced *Yukon Brewing beer (www.yukonbeer.com), available in a variety of flavourful styles such as Midnight Sun (espresso port) and the flagship Yukon Gold, an English pale ale. With a population of 26,000 and growing, the rather sophisticated capital of the Yukon dwarfs the combined citizenry of the remaining territorial villages and outposts. Its rich arts and cultural life is bolstered by an active outdoors community that mountain bikes and river canoes in summer and cross-county skis on kilometres of trails during the long winter. Located near the territory’s south end, Whitehorse is the launching spot for nearly all Yukon road trips to the north and west. 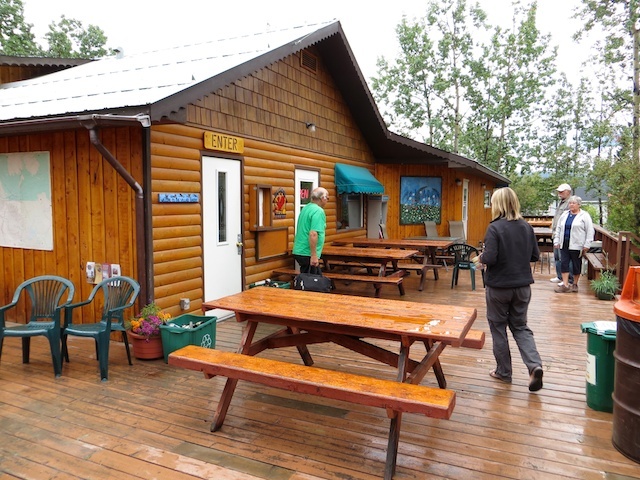 Whitehorse boasts a vibrant café scene. While Baked Cafe + Bakery (108, 100 Main Street) is the most popular coffee gathering spot, with nice organic scones, the best bet is The Claim, featuring good breakfast snacks, homemade chocolates, paninis and daily lunchtime specials such as lentil curry soup and tabouleh salad with local tomatoes. Craving a strong jolt of java? 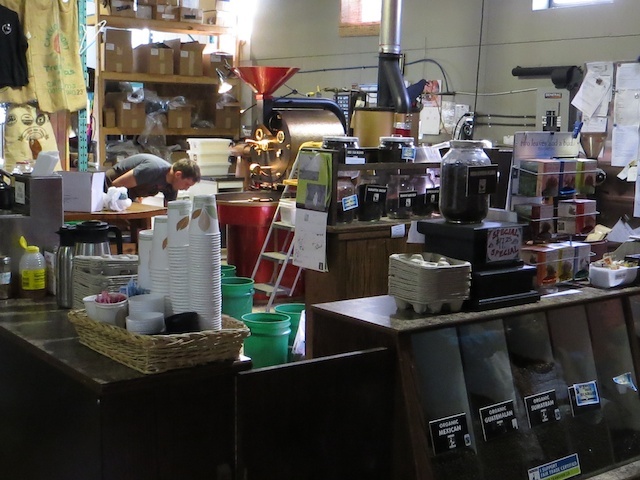 Head to Midnight Sun Coffee Roasters, attached to a bicycle shop, and sip an espresso or pick up a pound of Bushwacker’s Blend while you watch a batch of beans being roasted. A Whitehorse landmark is *Alpine Bakery, where all of owner Suat Tuzlak’s (love that name) products are vegetarian and organic. The bakery churns out a large selection of hearty loaves including sourdough, rye, ciabatta, flax and spelt; some are baked in a brick oven. We carried a couple of these dense, sustaining loaves on a 10-day backpack, without any crumbling or mold forming. A lunchtime treat here is a square of pizza (the roasted beet and onion is delicious), eaten on the back patio and washed down by a strong coffee. 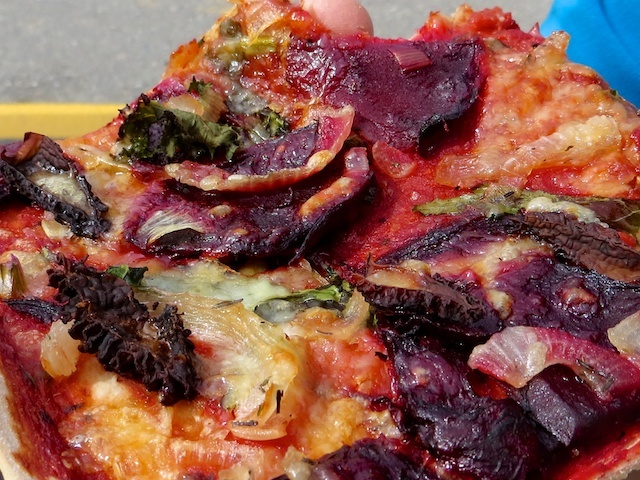 How about a delectable slice of beet and onion pizza at Alpine Bakery? 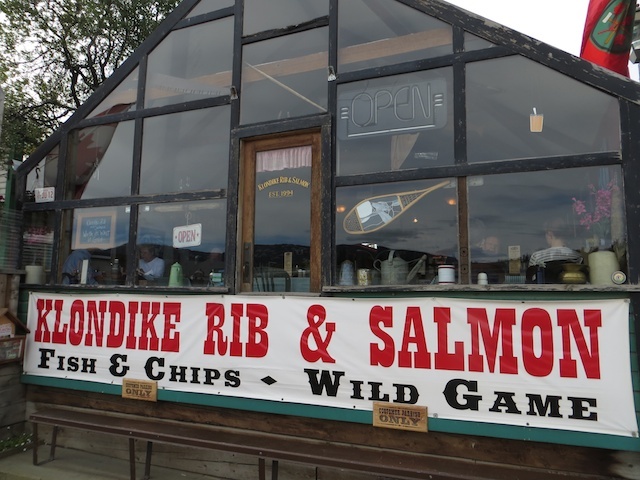 For a combination of historic ambience and good food, it’s hard to beat Klondike Rib & Salmon BBQ, located in Whitehorse’s two oldest buildings, including a former 1900 tent-frame bakery. The portions are generous and the service attentive at this popular spot, which might have a mid-summer lineup in prime times (prices are considerably cheaper at lunch). 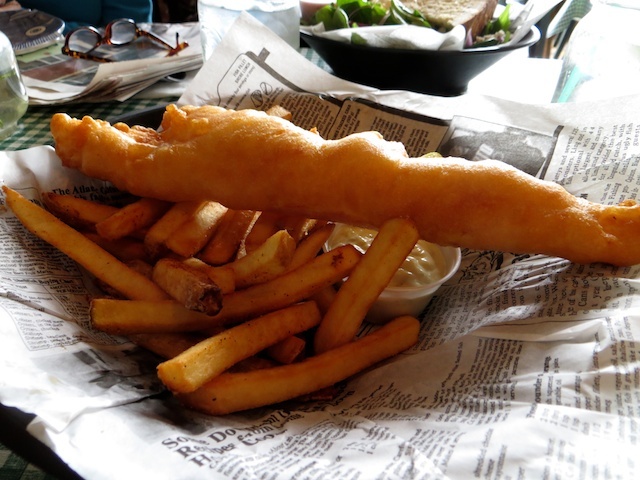 The lightly battered Alaska halibut and chips is bursting with fresh-caught flavour; one piece is enough for most appetites. Another good choice is Sockeye Sally, with smoked salmon stacked on house-made focaccia bread and topped with sautéed garlic and Portabella mushroom. If you have room, the oversized desserts include fruit pie, brownies or bread pudding. A popular lunchtime hangout is Yukon Meat & Sausage, known locally as The Deli. Here, you can custom order large, affordable sandwiches or pick up distinctive supplies, such as caribou smokies, for your road-trip adventures (203 Hanson Street). Heading west of Whitehorse, the Alaska Highway (#1) is a quiet paved road in fine shape, thanks to continued Canadian and American government investment in its upkeep within the Yukon. 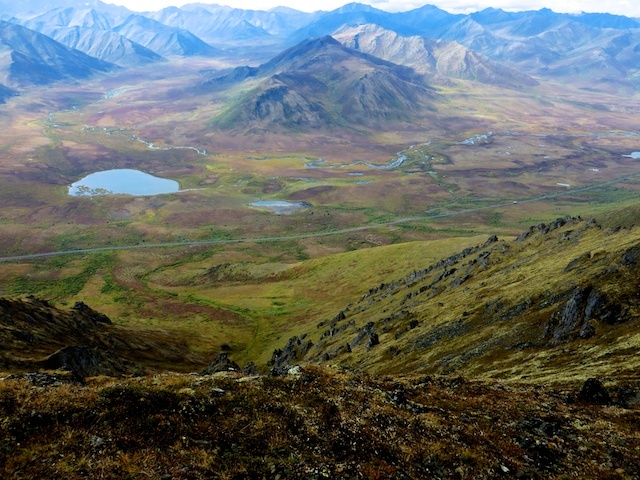 It provides access to adventures in the St. Elias Mountains and, further northwest, to Alaska and its major communities of Anchorage and Fairbanks. 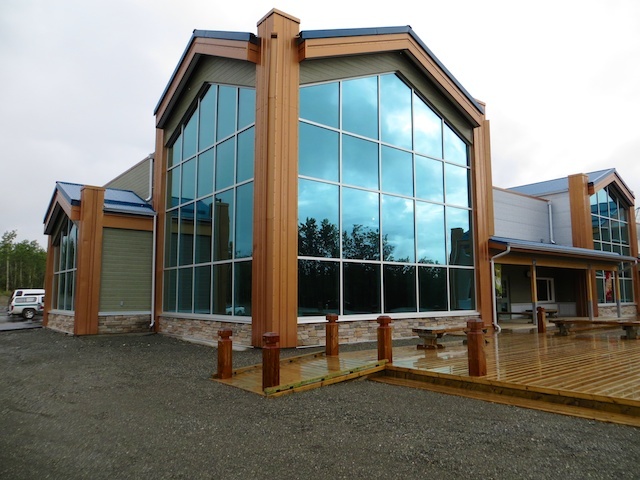 Ninety minutes from Whitehorse is Haines Junction, where the Kluane National Park Visitor Centre is lodged in the palatial new Da Ku Cultural Centre. Across the highway, is where locals and tourists alike flock. In this otherwise vast, unpopulated landscape, it’s surprising to find anything more than weak, stale coffee and packaged treats. As if to compensate for this scarcity, Village Bakery does it all, from morning espressos, cinnamon buns and cheese buns/breads to hearty dinner lasagnas, pizza slices, vegetarian tortes and big scoops of ice cream. On summer Friday evenings, there’s a salmon barbecue buffet, with live music. This entry was posted in Canadian restaurants, Haines Junction, Kluane National Park, Tombstone Territorial Park, Whitehorse, Yukon Territory and tagged Haines Junction, Kluane National Park, Tombstone Territorial Park, Whitehorse, Yukon Territory on August 27, 2013 by bcorbett907.